Measuring some 30 miles long by seven miles wide and aligned from north east to south west, Jura is the wildest and emptiest of all Scotland's inhabited islands. Most of the population of the island lives in the village of Craighouse with others living in the tiny settlements strung out along Jura's only single track road, running around the south of the island and up the southern two thirds of its east side. Much of the rest of Jura is given over to the 6,000 deer thought to live on the island. 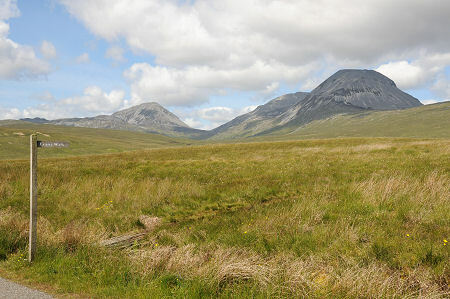 Jura's interior and west coast are accessible only with considerable difficulty, and the island is almost divided into two equal parts by Loch Tarbert. The southern half of the island is dominated by the Paps of Jura, whose name very aptly describes the shape of the three 2,500ft mountains that are by far Jura's most distinctive features when seen from Islay or from the mainland. Accounts differ about the origin of the name of Jura. Some will tell you that it comes from the Old Norse for Deer Island reflecting the wildlife. Others suggest it comes from the Old Norse for Udder Island reflecting the shape of the paps. And a third opinion is that it comes from a blend of Old Norse and Gaelic meaning Doraid's Island. This third view finds support in the name of the island being recorded as Doraid Eilinn in AD678, the year in which Jura was said to have been the site of a major battle fought between Picts and Scots. In times past Jura was a staging post for droves of cattle en route from Islay to markets in central Scotland. 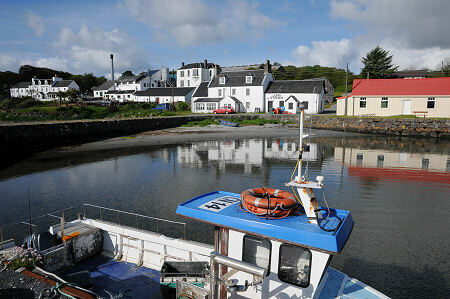 Recent years have also seen a passenger-only ferry service linking Craighouse with Tayvallich on the mainland. But despite proposals for a direct car ferry, visitors wishing to bring their car from the mainland to Jura must first travel to Islay, before catching the ferry from Port Askaig across the half mile wide Sound of Islay to Feolin on the south western coast of Jura. With only one significant road on the island, visitors to Jura have little chance of getting lost, or of bypassing any of the main attractions. Near the southernmost tip of the island the road passes Jura House, long the seat of the Campbells of Jura and built in the years around 1880. This has an extremely attractive walled garden that used to be open to visitors throughout the year: when we visited in June 2011 it was "closed until further notice", and it seems that it will not be reopening to the public. Further on, the road reaches Jura's only village at Craighouse, looking out over Small Isles Bay, which as the name implies is protected by a group of islands collectively known as the Small Isles. Craighouse is home to the 18 room Jura Hotel, the Jura Stores, Jura Hall, and Jura Parish Church. The centre of the village is dominated by the Isle of Jura Distillery. This was established in 1810, expanded in the 1870s, and closed in the early 1900. Most of what you see today dates back to a complete rebuilding in the early 1960s and an expansion in the 1970s. The hamlet of Keils lies just to the north of Craighouse and contains both traditional crofthouses and their more modern equivalents, and many ruins. The nearby cemetery at Kilearnadil is the location of a mausoleum erected to commemorate the Campbell family. It is also the last resting place of Gillouir MacCraine, said to have kept one hundred and eighty Christmasses in his own house by the time he died in about 1646. Beyond Craighouse the road north continues along the east coast to Lagg. This was once the terminus for a drovers' ferry to Keillmore on the mainland, which used the slipway and pier built here in 1810. The nearby drovers' inn is now a farmhouse. An account from the mid 1800s suggests this quiet spot was once frequently the site of riotous drinking as drovers waited for weather delayed ferries to sail. Other tiny settlements along the road north include Tarbert, Inverlussa and Ardlussa. Not far north of Ardlussa the public road becomes a private track, which leads to Barnhill. This is the farmhouse where George Orwell lived when he was writing his novel 1984 in 1948. Another couple of miles brings you to the northernmost tip of Jura, overlooking the narrow Gulf of Corryvreckan which separates it from the neighbouring island of Scarba. The gulf is home to a notorious whirlpool which renders the passage between the two islands officially unnavigable and whose roaring waters can, when conditions are right, be heard a dozen miles away. A great alternative to driving yourself around the island is, as we did, to take an excellent island tour with Jura Island Tours. Jura's history is an ancient one, as evidenced by a number of standing stones and other relics. Christianity arrived with St Earnadail (sometimes called St Earnan), the uncle of St Columba and one of those who accompanied him to Iona. He either preached or was buried (or both) at Kilearnadil. The story of Christianity may actually go back a little further than this: it is thought likely that Jura is the island referred to in St Columba's biography as "Hinba", where he established a monastery before moving on to found the better known one on Iona in AD563. He later used Hinba as a place of retreat and is said to have had a number of visions here while meditating. In more recent times the island was surprisingly populous, reaching a peak of 1,312 residents in 1831. Thereafter there was a decline which carried on, census after census, until 2001, when 188 people were recorded as living here. Hearteningly there was a slight increase, to 196, reported in the 2011 census. What is beyond doubt is that the few people who do occupy this large island are collectively the friendliest you will find anywhere: and Jura is a island you leave with regret.